In 1846 the restoration of St Mary's Church was nearly completed. It had been undertaken by the Vicar, Henry Alford, newly appointed by Trinity College, Cambridge, who held land and farms in the parish. His choice of architect was Augustus Welby Pugin, a man who was 'a High Priest of the Gothic Revival to whom architecture was not just a job but closely linked with his own spiritual Life' (from a leaflet The Story of Dean Alford). 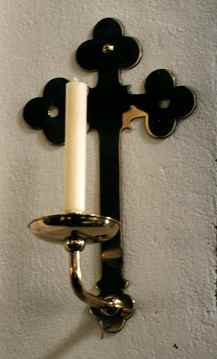 The restoration included candle sconces for the walls and pillars of the Church. Owing to the lack of access to record books of the Church, it has not been established when these were removed (perhaps when electricity was installed), but in the Very Reverend Lawrence Jackson's incumbency (1955-9) three remained, in very bad condition, and were removed during the work of replastering and repainting. The sconces as recovered from the boiler house. Fortunately the resting place of some of the sconces was known to Mr J. Bartram of London Lane. This was in the coke and boiler house. 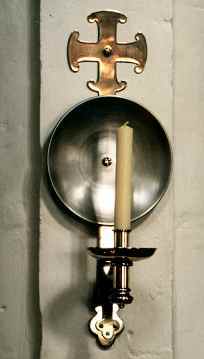 The restoration of these sconces was the major contribution made by the Wolds Historical Organisation in 1995-6. This was made possible by the idea of Alec Moretti to use the proceeds of the book A Walk Around Wymeswold for this restoration, and by the agreement of the members of the W.H.O. In the event we had not enough money and so a 'Sponsor a Sconce' appeal was published in the Christian Link, and private letters were sent out. We also applied for grants. We most gratified by the interest and the very generous response. The repairs and restoration were carried out by Mr Mark Verdier from near Northampton, with the kind guidance of Mr Michael White of the Leicestershire County Council Transport and Planning, Conservation Section: also with the advice and full support of Leicester Diocese. We are grateful for all their help. A donated framed calligraphic list of all the 'benefactors' is now hanging in the Church. Originally published in WHO Newsletter 1996.